Decided upon using Paintcore in late 2013 after receiving estimate from Rade to refinish and paint our dull, yellowed white kitchen cabinets and doors. Rade is a personable, knowledgeable guy who assured us of a great job. Two doors and one drawer were in rough shape, so he said he could build new ones to match. We said great and waited to hear back when they were done and ready for install. When install day came he said he couldn't match door style so he tried to fix the existing doors. He discounted the job accordingly, and the doors seemed okay. 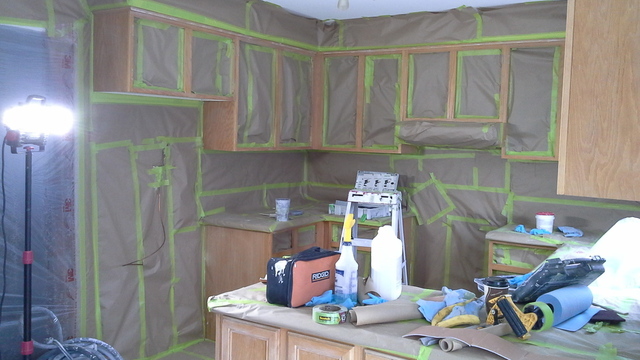 During the install, one area of the kitchen was not properly shielded from the painting of the cabinets. Some overspray ended up on our vinyl shutter. He had to come back for some touch-up on the doors and we pointed out the issue and he gave us a cleaning agent and some touch up paint for any other issues. This was appreciated, but the cleaner ended up deglossing the vinyl and over time has yellowed. Also, the doors that he had tried to save have started to have paint chip off the areas that were patched and painted. Were we happy initially?....Yes, but upon closer examination of the patch work done, it was below par. A little more care in the sanding and finishing of the troubled areas would of made them last a lot longer. I came across Paintcore after considering numerous options to update my kitchen. 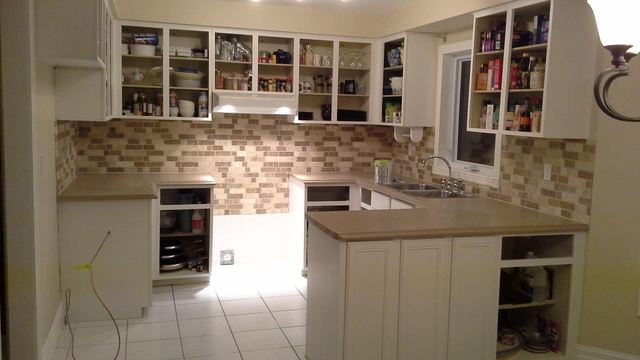 A custom kitchen was out of the question and re-dooring seemed quite expensive as well. I came across Paintcore and had Rade price my project. 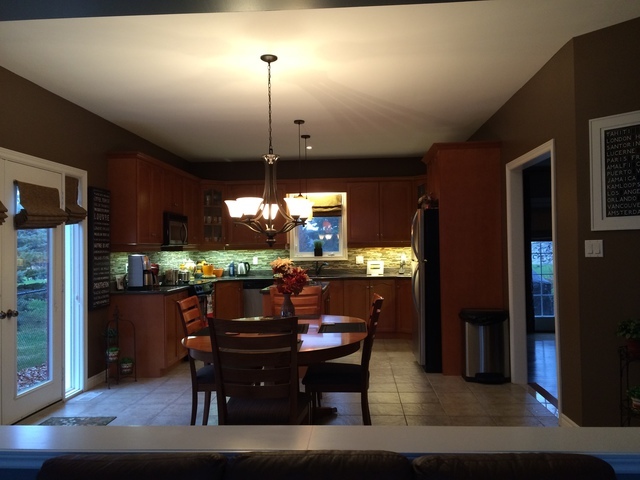 The kitchen re-finish was part of a large project to completely update my main floor, stairs etc. Rade was very professional in responsiveness and service. 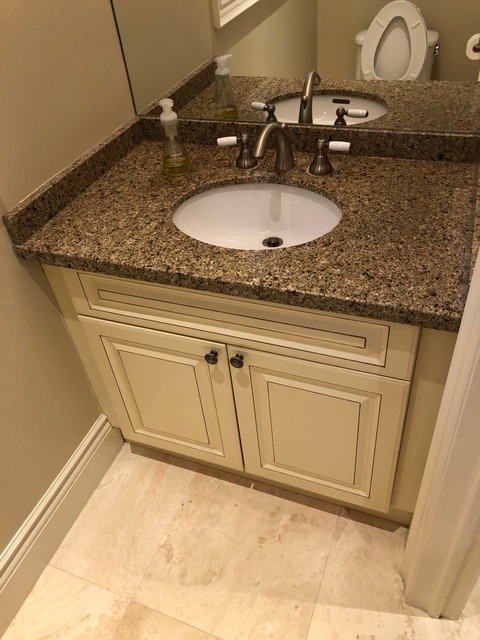 He made recommendations on colors and extra improvements and his crew did an exceptional job of taping off the area and spraying the cabinets. 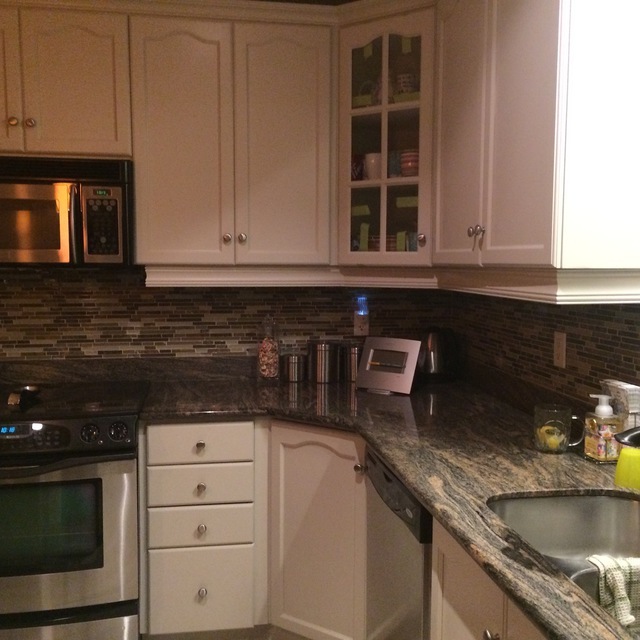 The quality of work was exceptional and our cabinets look like like new. 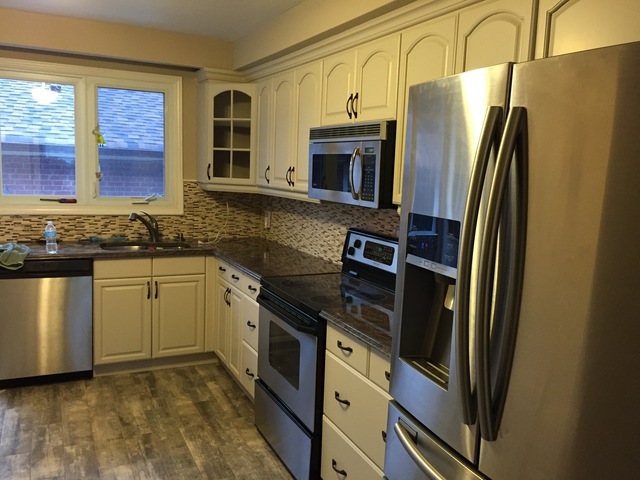 Neighbors and friends have stated the kitchen is a standout in our renovation. Well...well worth the cost! I could not be happier with the quality of work and level of service. I would recommend Rade and Paintcore to anyone considering updating their kitchen.....trust me ..save the money for a new kitchen and have the existing one painted...you will not be disappointed. Thanks again Rade and team! Paintcore was recommended to me and proved to be outstanding. The process is simply in that they provide a quote online, visit onsite and then book and show up. Outstanding results. They even took the time to spray our crown molding at our house to be sure it would not get damaged. Hugh transformation for reasonable cost in a short period of time. 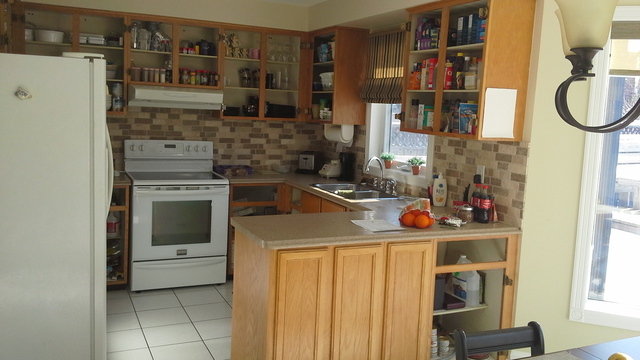 We have a kitchen that is 12 years old in maple in a cinnamon colour. 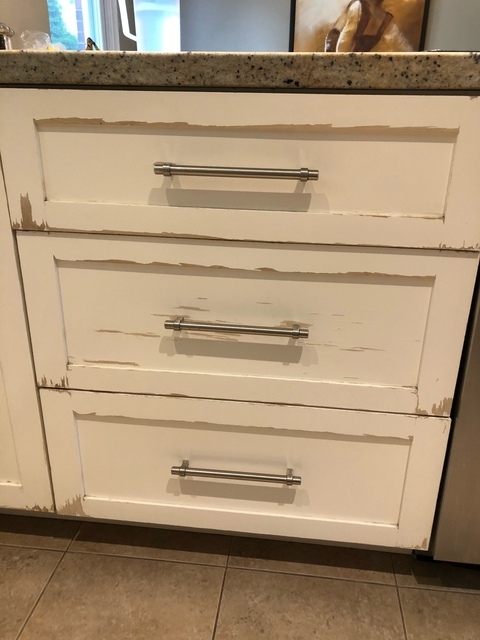 The finish on the cabinets was starting to look old and worn out. The layout of the kitchen we still enjoy so we decided to just have a " new look" with a new paint job. I'm extremely pleased as I feel like I have a brand new kitchen. My husband is happy as I may now want to spend more time in the kitchen and cook some nice meals!! Very pleased with paint core and I would highly recommend them. I came across this company while I was researching cabinet refinishing, our cabinets were in good shape just need to be spruced up. Their web site says to just send pictures and they will response with a quote. I like to see the person I am dealing with so they offered to send someone out. Rade showed up and in 10 minutes he had emailed me a quote. the work would take two weeks and they were running about 3 months out. After a little more research on the company we decide to go with them and set a date. A couple of days before the date we recived a confirming call that the guys would be on site around 9:00 am. 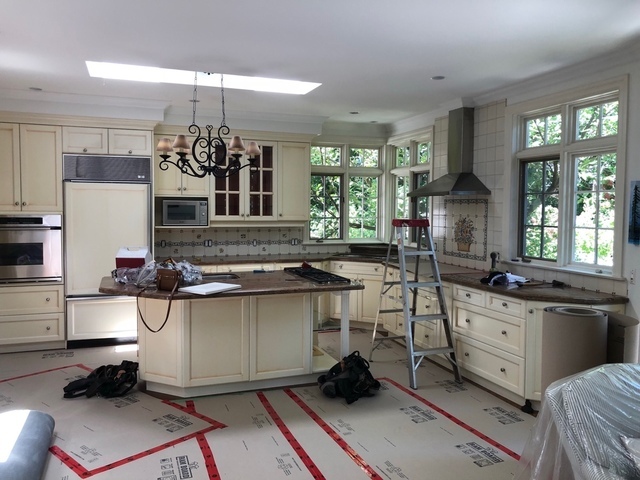 At 9:00 am the guys should up remove the doors and drawers, tape off the not to be painted surfaces, spray the cabinets and leave. this is where the glitch happened, they got delayed and would not be able to make the second appointment (2 weeks later). this was not a problem for us but as we were going out of town they did not come back for 4 days. When they finally came back they re-installed the drawers and doors and touched up any "blemishes we" had found. All in all they did a great job and even adjusted the final payment without asking to say "sorry" for the delay. I would not hesitate to us these guys again or recommend them. Paintcore was a great company. They were on time and responsive to all my inquiries. Their work was outstanding quality , the guys were so respectful of our home and cleaned up beautifully. I would highly recommend them to anyone who is considering painting their cabinets. These guys are amazing. Kitchen refinishing Large custom white raised panel. 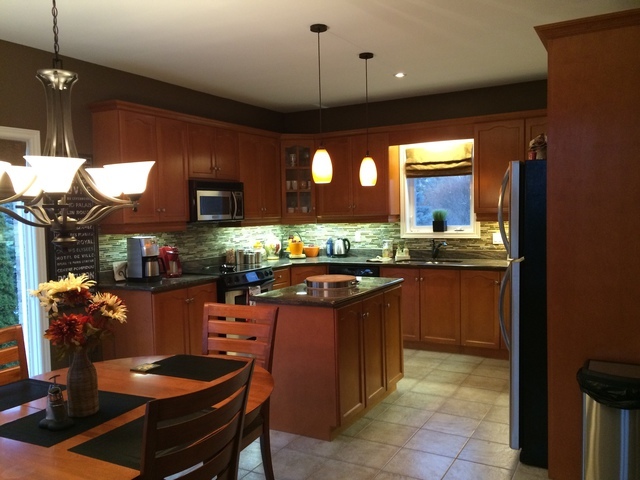 We have had our custom kitchen for 24 yrs . 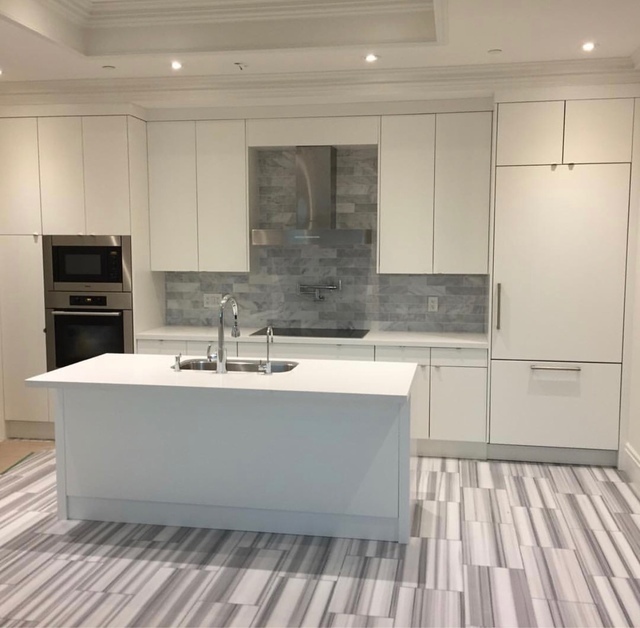 It was a highend Beckerman Kitchen in white raised panels. After all those yrs of heavy daily use (we cook everyday) it was starting to look a bit tired . 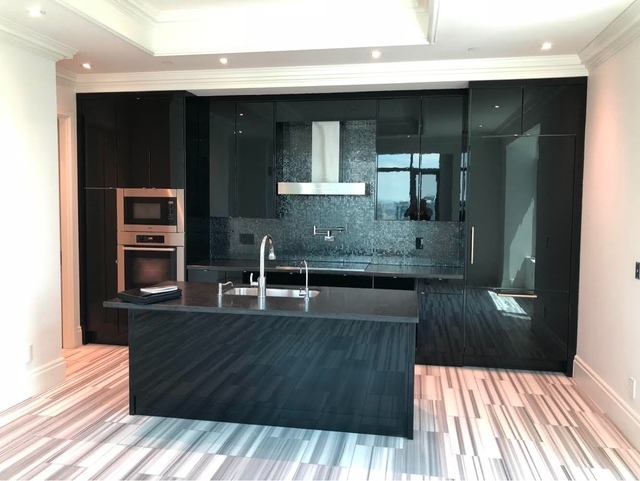 We met Rade at the Toronto Home Show and were immediately impressed with their product and services and contracted them . They took the panels back to their shop and refinished them to as new condition.The rest of the kitchen had to be sprayed onsite and because of the distance was done in 1 day. A fantastic job ! We are extremely pleased and recommend them unconditionally. Right from the beginning Omar was a professional. Farouq is an absolute magician with the spray gun. We have had a number of friends and family over since the kitchen was done and every one of them have thought we got new cupboards. 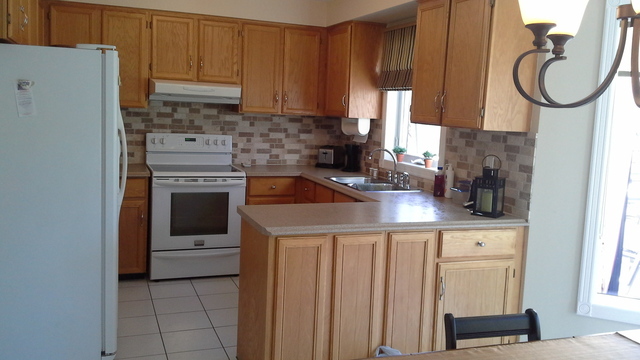 Paint Core refinished my outdated oak kitchen cabinets, to a new polished, sharp look - we went with "Cloud Cover". Very happy with the results!! I was not 100% how things were going to turn out, but I can honestly say this is an excellent alternative to spending a chunk of change on a kitchen reno. A couple of minor hiccups, but Omar was able to address after the cabinet doors were installed on a separate visit. I am big on Customer Service and customer experience. After all, I need to live with the kitchen after the job is done! I have a picky eye, and Omar was able to satisfy my high standards :) Thanks Omar and Farouk! We first came across Paint Core at a Toronto Home Show in 2013. 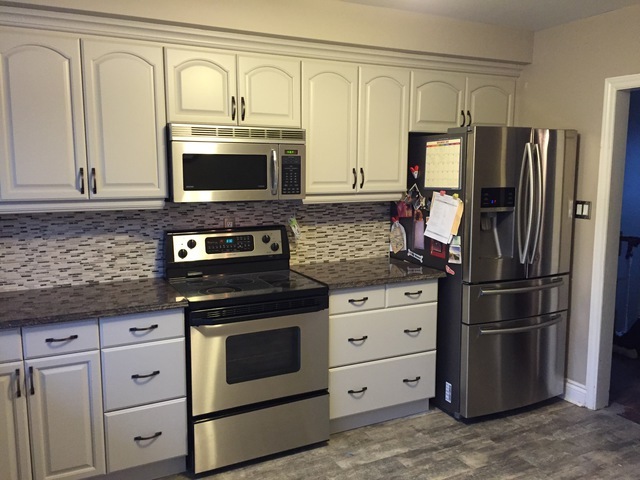 After spending considerable time investigating the cost and process involved in first replacing our existing kitchen cabinets and then refacing them, we were left overwhelmed with both cost and time to complete the projects. 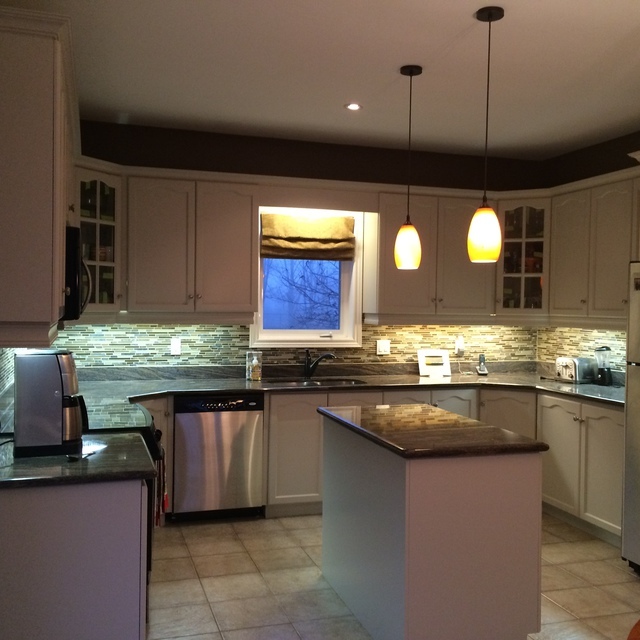 We attended another Home Show in 2014 and came across Paint Core a second time. This time, we saw that they had the endorsement of Drew and Jonathan Scott - the Property Brothers. So, being big fans, we decided to call Paint Core out to give us a quote. Omar came out (at a time convenient to us! ), and brought some sample colours based on pictures we had sent him. His colour suggestions were exactly what we had envisioned. We had two main concerns about painting. One was alleviated with his colour recommendation. The other, which in all honesty we took a leap of faith, was how the finished product was going to look as we were painting oak cupboards with a prominent grain. He said, "Trust me. They are going to look fantastic." And they do! The process couldn't have been easier. Nick came one day and removed all the cabinet doors and drawers. The only thing we had to do was empty the drawers (NOT THE CABINETS!). 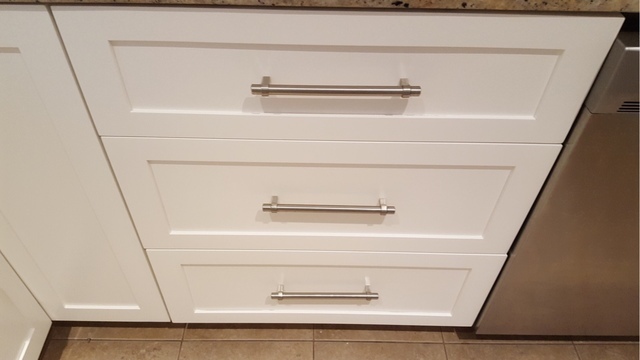 He also removed all the hinges and existing cabinet hardware. Omar and Farooq came back in two-weeks time and sanded and sprayed all the boxes and exposed oak fronts that couldn't be taken into the shop to be sprayed. They sealed everything completely! There was absolutely no overspray anywhere. The next day, Nick came back to install our newly sprayed doors and drawers and our new hardware ... and our 25 year old honey oak kitchen was immediately transformed into the 21st century. It looks fantastic! One of the things we found out immediately is how easy the spray finish is to keep clean! We went with a Cloud White finish and greasy finger prints and food marks wipe clean away. 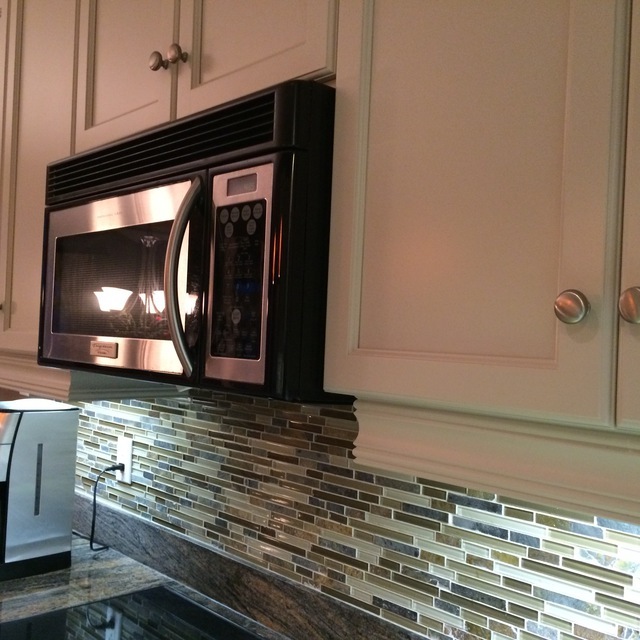 equally beautiful alternative to replacing or refacing your kitchen cabinet. 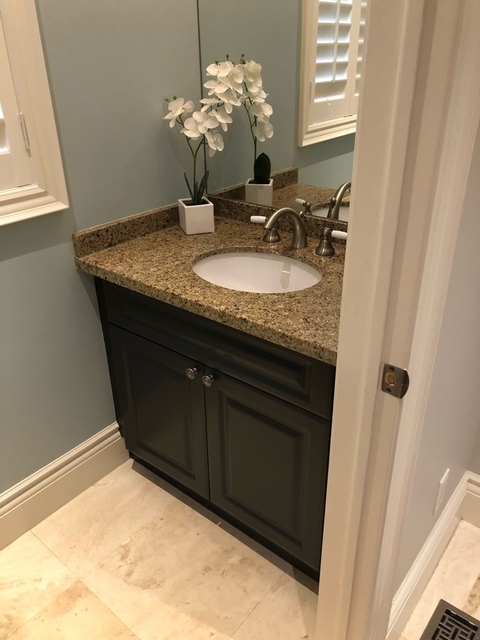 We already had our backsplash and countertop in place, but even if you are changing those, you still can't beat a Paint Core finish. They deliver on their promises and when Omar says, "Trust me. ", you most certainly can! We went from thinking we needed a full kitchen remodel to loving our kitchen just as we did the day we moved in. Thank you Omar, Farooq, Nick and Paint Core Finishes!